Summer is an amazing time to be in Amador County. From the warmer weather to stunning scenery of the foothills, summer time in Amador County is truly a sight to see. The best parts of Amador County are the vineyards. The acres of vineyards throughout Amador are full of life and bustling with endless possibilities. During this time veraison has started to occur in our vineyards. Veraison marks the beginning stages of ripening. For our red varietals, such as the famed Zinfandel, veraison causes the berries of the grape cluster to change from a bright green to a dark red. This unique color transformation is absolutely a breathtaking experience that every wine lover should see. Veraison is not just limited to that stunning color change. During veraison, the berries will change from acidic to sweet in flavor and aroma. This process in vineyard development is important because it lets our team of viticulturists know that harvest is fast approaching. Post veraison, our viticulturists will work with the winemakers to determine if the time is right to begin harvest. This is accomplished by measuring the sugar levels of the berries in the wee hours of the morning when it is very cool. Once the desired sugar levels are met, harvest will begin. For some of our wines, like our Late-Harvest Zinfandel, harvest will occur in late September early October. This happens for several reasons. First, Zinfandel grapes are notorious for not ripening evenly. It is common to find a cluster of Zinfandel grapes with ripened and un-ripened berries all within the same cluster! 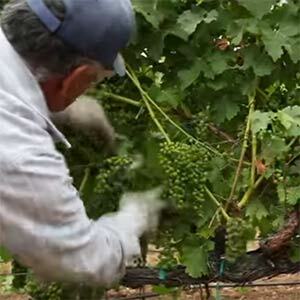 By waiting for a late harvest, it ensures a cluster of Zinfandel berries to be more evenly ripen. Second, other varietals like the Riesling benefit from a Late Harvest and produce a sweeter product. 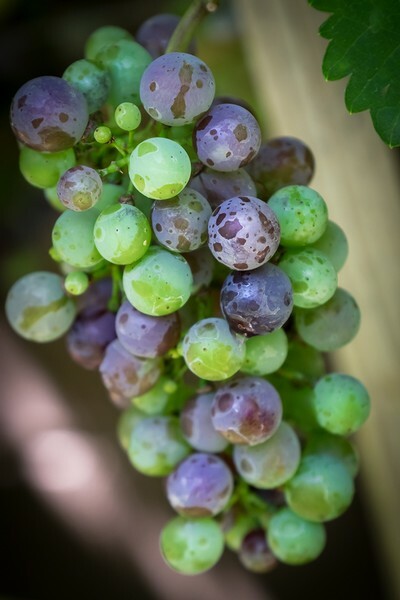 Veraison is an amazing site to experience and plays a significant role in the process of winemaking. Experience the summer of Amador County and the wonders of veraison while you can. Summer is here, and it's a great time to enjoy the sights and sounds along Amador County's first wine trail. Besides the beautiful vineyards, there's never a dull moment at any of our wineries. Here are some of the highlights so far, and some events you can look forward to. There’s no shortage of great music to be heard throughout the network of wineries associated with Start on Steiner. Recently, Bella Grace played host to the Wicked Sisters, who have been making great music in and around Amador county since 2007. If you need something to sip while listening to great music, consider Bella Grace’s 2017 Rosé. This delicious vintage claimed double gold at this year's San Francisco Chronicle Wine Competition and a gold medal at the "Drink Pink Vino International Rosé Wine Competition." You can enjoy it and other wines this 4th of July during their normal tasting hours. Wine may be leaving, but the animals are coming. The folks at Charles Spinetta are saying goodbye to the last remaining bottles of Chenin Blanc, Heritage Red, and Zinfandel. If you’re looking for those favorites, be sure to contact the winery to see if they are still in stock. As you may have guessed based on their fabulous label design, the team at Chales Spinetta are fans of wildlife. Tune into their Facebook page to watch for plenty close encounters. Recently, they’ve crossed paths with Killdeer eggs, ducks, toads and a turtle. The wines of Amador County are winning big at various festivals and competitions, and Deaver Vineyards is no stranger to top marks. They recently entered 5 wines into competition at the Amador County Fair and returned with 5 medals! In fact, the 2015 Ten Zins got "Double Gold” again. But if you’re looking for a particularly refreshing summer sipper, try Deaver Vineyards recently released Raspberry Sparkling. Dillian Wines has hosted a number of fabulous events in association with their brand new releases. They kicked things off this spring with a Sauvignon Blanc and street tacos party. Not to be outdone, their Zinfandel got a fine release of its own being sampled alongside some delicious pizza. Be sure to tune into their Facebook page to keep up with their latest events. Like many of the wineries that are part of the Start on Steiner family, Iron Hub Winery knows how to throw a great music event. They have a number of fantastic musicians coming to their property including upcoming guests like Jesse Hendricks and Tom Powers. And if you’re looking to have some fun around the upcoming Fourth of July weekend and beyond, be sure to join Iron Hub Wines for their Red, White & No Blues events. While celebrating America’s Independence, you’ll have the opportunity to sample some fantastic library wines and learn the history of the winery. If you love world class Zinfandel paired with music and more, you’ll want to check out Renwood Winery’s Sip, Savor & Sounds events. You can try a flight of wine or order by the glass while listening to the fantastic music of Christopher Gene. And if you love competition, you can’t miss the first annual Shenandoah Smackdown. This event places Renwood Winery against Paul J. Wines in a wine pairing showdown. With a four-course meal crafted by Chef Beth Sogaard, attendees will taste wines with each course and vote on the best pairing. If you’re a fan of all the wines that Amador County has to offer, you can’t miss out the must-attend event of summer: Sippin’ on Steiner. On Saturday, August 11, you’ll have the opportunity to experience all the wineries in the Start on Steiner family. In addition to one-of-a-kind opportunities to taste library wines, experience amazing pairing and enjoy music and art, you’ll get a commemorative logo glass too! This event will sell out, so be sure to book your tickets today by contacting Jennifer Hunt at (209) 245-6979 ext. 217. With summer on the horizon, you’re more than likely to choose white wines over reds. You know the feeling. It’s a perfect summer evening. You grab a bottle of chardonnay from the fridge, throw it in a big bucket of ice and pour it into some stemless glasses to enjoy in the backyard. Truth be told, most of us aren’t. And when you take the time to serve wine at the perfect temperature, you can enjoy reds, whites and rosés year round. Plus, you’ll get the full impact of aromas and flavors in your wines. For starters, your whites are likely too cold. But don’t panic, we’re not suggesting you get out the thermometer for the precise pouring temperature. Generally speaking, white and rosé wines taste best between 50 and 60 degrees fahrenheit. So if you have a bottle of white wine chilling in the fridge overnight or sitting on ice, it’s definitely too cold. To get the temperature just right, we suggest leaving your whites and rosés in the fridge for a couple hours. Once they’re out of the fridge, there’s no need to throw it in the ice bucket or put a sleeve around it. The glass bottle will insulate the wine, and its temperature will rise slowly. You should pause to notice the difference between your first glass and your second. Is the wine more aromatic? Did you find new flavors that were once hidden behind the frosty chill? We bet you’ll discover a whole new personality in some of your favorite white and rosé wines. As for reds, you’ll want to cool them down more than you’ve thought. Red wines can benefit from as little as 10-15 minutes in your freezer (just don’t forget about them). If you’re confused, it’s probably because you heard that red wines are best enjoyed at at room temperature. This is a bit misleading. Most of us in the United States keep our houses somewhere between 68-73 degrees. This is far too warm for any type of wine. The ideal temperature for red wine is somewhere between 60-70 degrees. Lighter reds tend to do better with more of a chill on them. Try out a lightly chilled beaujolais and cheeseburger to see for yourself. Full-bodied reds are about right at room temperature or slightly below it. Like whites and rosés, we suggest experimenting to find the perfect temperature to enjoy your favorite wines. It’s easier to start on the colder end of the range and notice how it changes as the temperature slowly rises. And if your red wine seems a bit more tannic or acidic than usual, it’s probably a bit too cold. Just be patient and let it come up a few degrees to find its comfort zone. For sparkling wines, you’ll want these well chilled. Now is the time for the ice bucket. The ideal temperature for sparkling wines is between 40-50 degrees fahrenheit. Have you ever opened a bottle of sparkling wine to have it explode and fizz everywhere? The wine was too warm. Similarly, if you find that your sparkling wine is a bit too foamy, a chill will help you get those refined bubbles you’re looking for. Remember, these are just guidelines to get you started in finding the perfect temperature to enjoy your wine. Everyone’s tasting experience will be different, but try out these wine temperature ranges to see for yourself. Planning the perfect picnic or backyard BBQ can be a difficult task. 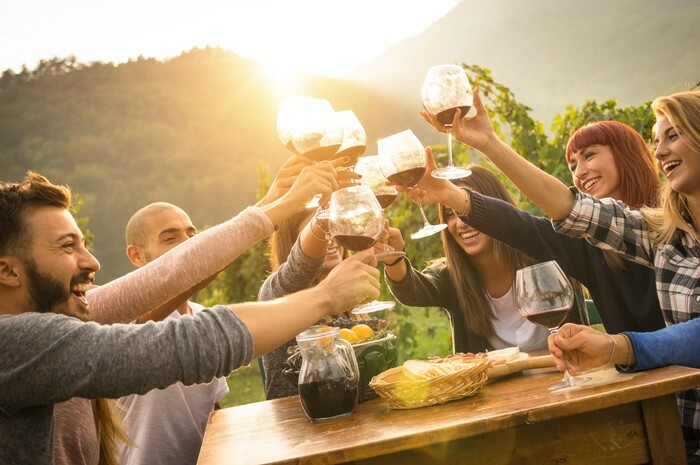 That’s why we’ve put together a list of some of our favorite wine and food pairings to help you host an ideal summer event. 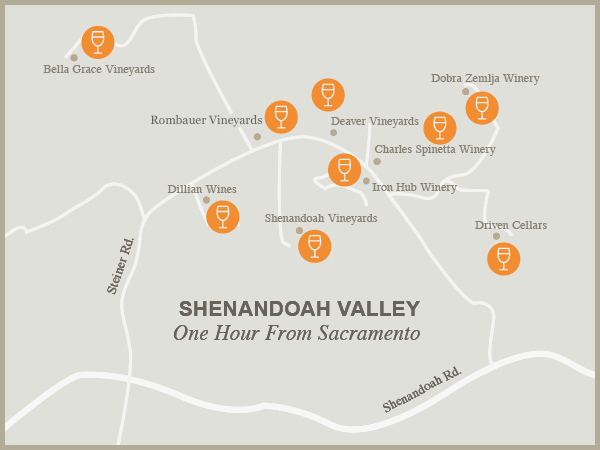 Shenandoah Vineyards 2014 Carignane - Perfect for a backyard grilling marathons full of wild game sausages. Renwood Winery 2017 Viognier - A great match for spring/summer salads like Chicken, Pear, Gorgonzola & Walnut Salad. Iron Hub Winery 2014 Old Vine Zinfandel - Elevate your deliciously, sticky BBQ ribs and pulled pork sliders. Driven Cellars 2015 Petite Sirah - Anything sweet and savory. We’re thinking a juicy burger topped with arugula, goat cheese and jam. Yum! Dorba Zemlja Kikas - Dessert! Pair with your chocolatey sweets or enjoy on its own. Dillian Winery 2015 Vino Nostro - A great addition to pizza night when you don’t feel like firing up the grill. Deaver Vineyards 2016 Verdelho - Quenching your thirst alongside ceviche or raw oysters. Charles Spinetta Winery Rosé - An alternative to dessert (or in addition to it) this semi-sweet rosé will certainly please your guests palates. Bella Grace Vineyards 2017 Vermentino - Great by itself on a hot day or pair with spicy shrimp tacos. In a sense, so much of the year’s labors have led directly to this point. Harvest. This year we have walked with you through how the rains of this past winter impacted the vineyards, the decisions that affect the living vine and how that vine will produce for years to come, the importance of pruning and leaf thinning and how these processes contribute to yielding grapes that are ripe and sweet and ideal for making wine. As it is with most of the wine making experience, Harvest is a balance of knowledge, instinct, and experience. Our winemakers have honed their physical senses to determine the optimal time to pick the grapes from the vine and combine their senses with their scientific knowledge. From the color of the grapes, to the texture and taste, and even the scent in the air, all signs indicate that we have entered the harvest season. The cool night air will protect the grapes across various vineyards as workers race the dawn to bring in the harvest. The sweet scent of fermentation will permeate the air and, if you have never experienced harvest, there is nothing quite like the smell. For the next few months, the wineries along Amador’s First Wine Trail will be focusing our efforts to bringing in this year’s yield of grapes and crafting the next vintage of your favorite wines. And we invite you to come join us as we do so. 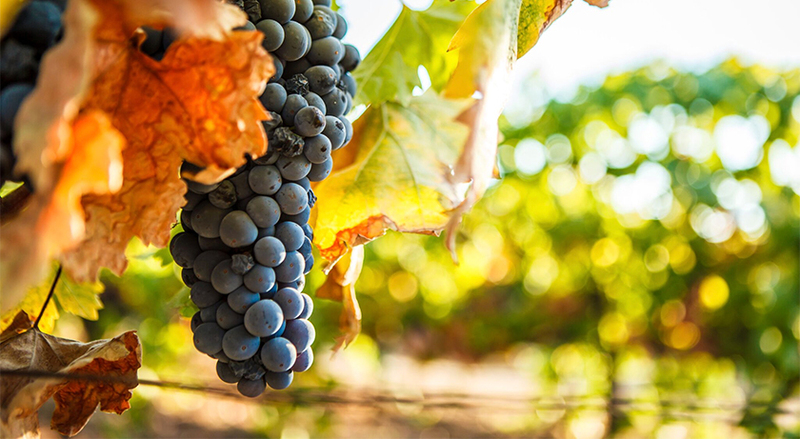 The nine wineries along the trail offer a diverse look into Amador county winemaking, and you don’t want to miss this exciting stage of the process. Come into the tasting rooms and experience the culmination of past harvests, and then come and visit us at some of the local celebrations of wine, like the 25th Annual Big Crush Harvest Festival. What’s Going on in the Vineyards? Canopy Management is a very official-sounding term for pulling leaves off of vines. Also referred to as "leaf thinning" or "leafing" it is the practice of managing the green growth in a vine to keep in balance with the fruit growth. Too much vegetation, and the grape clusters are hidden in the shadows and will not ripen evenly or productively. Another benefit leaf thinning offers is assistance with air circulation. Lack of air circulation from too many leaves is a factor in the development of powdery mildew (which can also lead to bunch rot). Interestingly, more vegetal growth does contribute to a wine's "vegetal" taste, but not in how you'd think. Chemical compounds are responsible for vegetal or herbaceous characters in some wines, chiefly the class of pyrazines called methoxypyrazines, or MP. MP creates the familiar green pepper/green bean aromas associated with many Bordeaux-type varieties. These chemical compounds break down in light. Several studies have revealed a strong relationship between exposure to light and decrease in MP content. So if the grape clusters receive light, not only do they ripen and gain red/black berry aromas, jam aromas, fresh fruit aromas, and fruity flavors, but the "green taste" that we associate with unripe grapes also dissipates. So, now we know more light is good, but this doesn't mean we want the clusters to get sunburned, either. It can easily get over 100 degrees in Amador county, and if not protected, the rays can damage the fruit, as well as the overall plant. If the climate is hot and sunny, like California's, the goal is for the clusters to be shaded by leaves for about half the daylight hours. Deciding where and when to remove leaves is a complicated task. The vineyard managers sit down with teams and look how can they can achieve the desired "appled" light effect - or get good light penetration to the clusters at different points of the year. They will strategize where and how they're going to leaf each plant because there are many row directions as well as elevations and exposures. For instance, if you have an east west row direction, then they would typically leaf on the North side which will allow the afternoon sun, or the South side, to be protected from the high-intensity head of the afternoon and evening. And this might change over the course of the year. They might look at a vineyard in July when the sun might be hottest on the morning side, but by September or even into October the heat might be on the opposite side of the vine. So then they might go in and do a second "leafing" to remove leaves on the interior part of the canopy to create this nice micro-climate environment for the grape cluster. We just got out of one of the wettest winters in history here in Northern California. Many have been asking what impact all the rains have on the vines. The reality is…not much. Grapevines go dormant in the winter, and can actually tolerate being submerged for around 20 days. In fact, the French once used vineyard flooding to control the Phylloxera root pest. The recent Northern California rains we short lived and spread out nicely. The biggest concern was erosion. Everyone was keeping an eye on trees, slopes and vineyard architecture like posts and trellises to ensure any shifting ground didn’t topple things to the ground. By now, most areas have recovered nicely and vineyard reservoirs are full and our water tables are ready for a bountiful 2017 harvest. For our entire state it’s pretty amazing to finally see our creeks full and so much green natural all around! After years of drought and vines struggling under the dry conditions we are happy to see this turn-around. Many wine producers all over the state has agreed they will take the continued rain over no rain at all, because it’s good overall. It’s a great feeling to get some “seasons” back. Many people in Northern California are complaining about the rain this year. But, we love the rain. You see, here in Amador County, we only get rain two, maybe three, months of the year. So, during that time, we need to fill up the water reserves and fill the clay soil as much as possible to sustain us through the growing season ahead. And, while the vines may look like they're taking advance of the rain and sleeping in late this time of the year, they are actually getting ready to explode out of their shells. It is during the month of February you will typically see pruning in the vineyards. 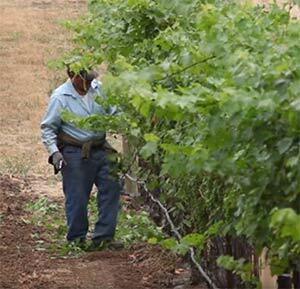 It can be argued that pruning is the most important process a vineyard worker can do to ensure vine health and the quality of the eventual wine. 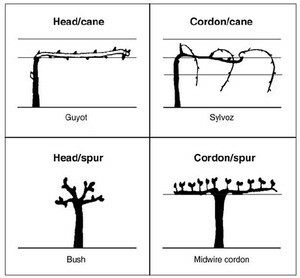 How a vine is pruned determine how many buds will develop, clusters will grow, and if the vine will be in "balance". Balance is what we all strive for, of course, but especially a vine. If, when pruning, a worker leaves too few buds, then only a few clusters develop. This means the leaves and tendrils can go wild. The vine has a dis-proportionate amount of energy going to leaves causing overly "vegetal" growth. Too many leaves mean that the struggling existing clusters don't get to the sunlight, and green pepper or vegetal qualities can seep into the wine. Too many buds left on the vine means there are too many clusters in proportion to the leaves and tendrils. The photosynthesis in the leaves can't keep up with the needs of the ripening fruit, leaving the fruit undeveloped and lacking complexity and depth. Or, the clusters are unprotected from too few leaves, and sunburn or raisining results. This isn't the end of the decisions. There are actually several different methods of pruning and subsequent "training". (Training is how the vines that will grow from the vine will be managed during the growing season.) These systems have complicated names like "low-head bilateral cordon". To go into the different types takes a semester at a good viticulture college to learn, and a lifetime to perfect, but basically it depends on the plant and the location. 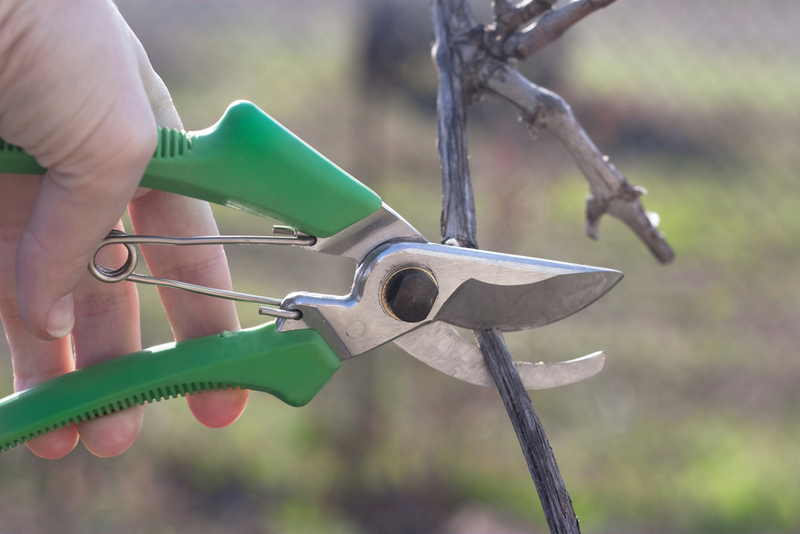 If the vine is in a location with good ground water, or a steep slope, you may choose to prune in a different manner to affect the growth of the eventual fruit and vine to give it the best chance of balance. Likewise, not all varietals are the same. An early-budding varietal, or a particularly vegetal varietal might be pruned differently than each other to help control growth. Not to add any more pressure, but being a living thing, vines have scars and growth. Meaning pruning marks build on each other year over year. So, the cuts the vineyard workers make this year will affect a vine for years to come. So, while it may look like quiet vineyards hibernating in the rain, February is actual a vital month in the 2017 growing season. While it may seem cruel to severely cut back the vines to naked little stubs this time of year, it is absolutely critical to the vine health, the vitality of the leaves and fruit, and the quality of the glass.